We’ve all been waiting an absurd amount of time for the return of Travis Touchdown, Suda51’s iconic otaku, and when Travis Strikes Again was first announced, it sent a long-dormant cult following into a frenzy – myself included. Though No More Heroes and its sequel weren’t perfect by any means, they were fascinating and fun, both gems of the Wii library. So Travis Strikes Again simultaneously has nothing to prove, and a lot to live up to. The first No More Heroes game was a pretty straightforward action game affair with Wii-waggle actions to perform satisfying moves, and the sequel was, err, well in many ways it was closer to a minigame collection. Once Suda51 had established his character and his world in his game, he wanted to take it to new places, and represent not just the action genre, but his love of video games as a whole. 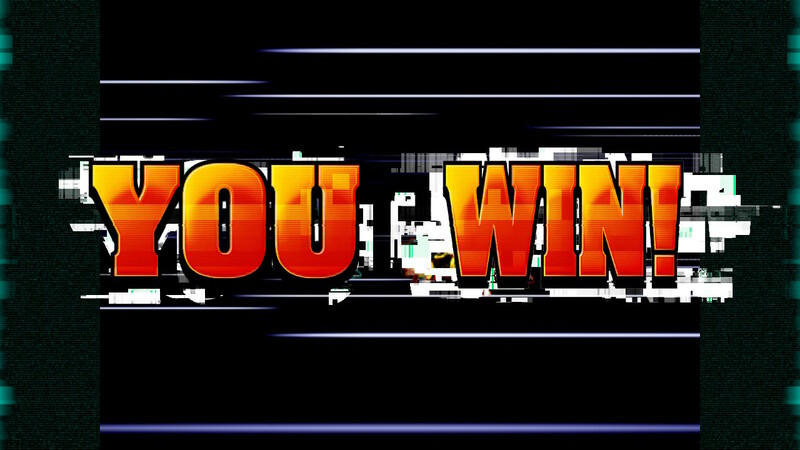 Related Travis Strikes Again: No More Heroes Giveaway – Enter for a Chance to Win One of Three Full Game Codes! 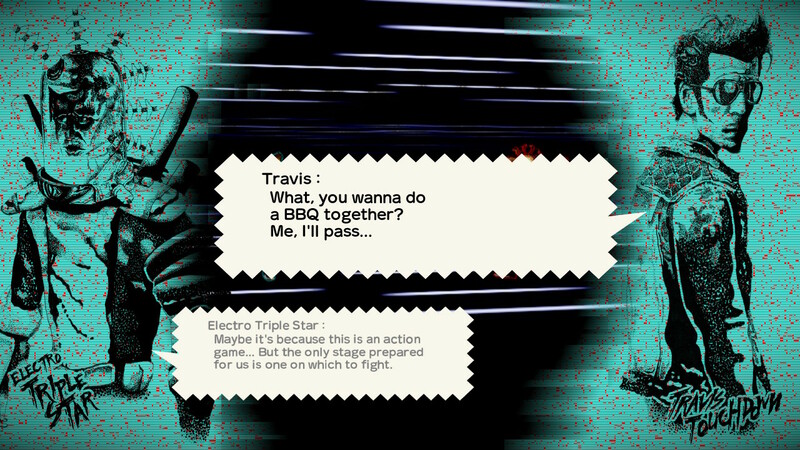 In Travis Strikes Again, Suda51 is finally allowed to go all out, and include any element of any game genre he wants. And the end result is fascinating. Whilst it is primarily a top-down action game, Suda51 uses the Unreal Engine to produce, well, whatever he wants to. And I mention the engine for a reason – the game won’t shut up about it. Travis wears an Unreal shirt. There are Unreal collectibles. There’s a freeze-frame in the intro cutscene which evangelises the power of the engine. And it’s easy to see why. Suda51 is not beholden to a specific or proprietary engine now, he can use a versatile engine to make any kind of game he wants, and as such, makes whatever he wants. Primarily an action game, but here you’ll find goofy FMV cutscenes, a linear visual-novel style experience that looks like something made on an ancient home computer and much more thanks to the Death Drive MKII, the dangerous game console that Travis uses to satisfy his bloodlust. Suda’s premise here is designed specifically so he can whatever he wants at any given time, and it shows. As a display of passion from one of the most eccentric men in gaming, it’s fascinating and essential. As a video game to play, err, it’s a little harder to recommend. Alright, let’s start with the action combat. Travis swings his fast attack quickly, dashing through weaker enemies by the dozen, but the stronger enemies slow the game to a crawl. Even if you make sure to level up whenever possible and get experience, stronger enemies will require hard, slow attacks which take Travis an age to complete – and no, dodge rolling will not allow you to cancel animations, meaning a cheeky extra attack can mean death. Yes, like Dark Souls, which is funny because this is as far from a serious, thought-intense action game as you can get. This should be closer to simple hack-and-slash fun, like the last two games. But that’s not the case. That wouldn’t be so bad, but unfortunately the levels are so long. So long. There are plenty of save points thankfully (which are toilets, of course) but by the time you meet the mid-boss you’ll likely already long be tired of the stage you’re playing in. I know I was. 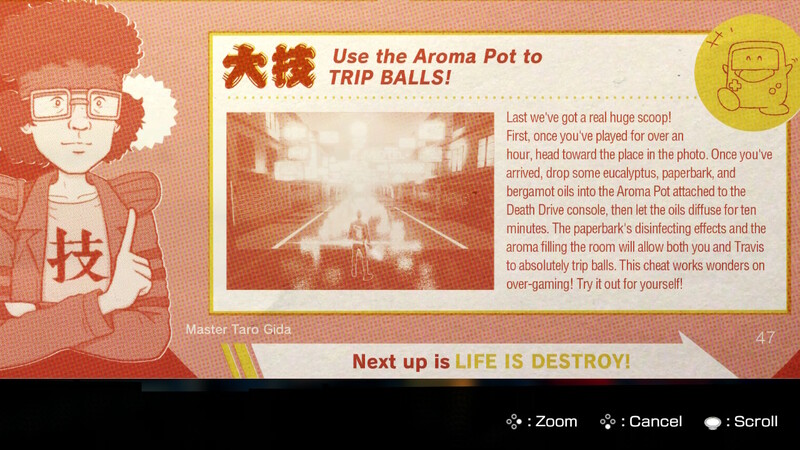 Which is a shame, because some of the quirky aspects of Travis’ trailer are more interesting than the game’s stages. Back at his trailer, you can look at interesting articles regarding the game’s stages, made to look like magazine spreads. These are seriously really nice and endearing. The visual novel story is also so well written and often funny, while puncturing the fourth wall. There’s so much to love right here, so much personality, but then I have to play one of the game’s levels. And I just feel frustrated. Travis Touchdown doesn’t just have his beam katana in Travis Strikes Again, though. He has multiple skills which can be expanded and swapped out with skill chips, allowing you to create a character that speaks to you. The first few chips come quickly, but then your move expansion slows down slightly. They’re nice and help break up monotonous sword swinging, but nothing ever does enough to make the game feel enjoyable. Thank goodness for the alternate character Badman, which you can play as, or have a friend join you in co-op. Although Badman levels up independently of Travis, meaning if you’ve been playing only one character for several levels, you might as well stick to them unless you want to replay stages. It’s hard to express just how much I like Travis Strikes Again, and how frustrating I find it to play. Ultimately, part of me thinks I would be happier to just have a Travis Touchdown themed visual novel where you fight people with witty comebacks. That’d be all of Suda’s attitude, with none of this annoying gameplay. Travis Strikes Again: No More Heroes is not a complete failure, and there's a lot to love here, but I'd be lying if I didn't say I was somewhat disappointed. While playing I skipped between being in love with the game's style and personality and sick to death of actually having to play. A fascinating experiment from Suda51, one I'm glad he made, but not the best game. Add a point to the score if you love Japanese eccentricity, take one away if you have no time for it.